A bit of history. | One year, one job. I can’t remember what I wanted to be when I was really little. I do remember my sister wanted to be a belly dancer, but that’s a whole other story. I think I probably went through the phase of wanting to be a Blue Peter presenter (who didn’t?!) and then I think I wanted to be a camerawoman on Blue Peter. It wasn’t until I was 16 that I settled on my first dream job. I wanted to be the editor of Australia Vogue Entertaining + Travel. Fast forwards four years and VE+T is out of print. Vogue Lifestyle has taken its place but it’s not the same. Other things have changed too. 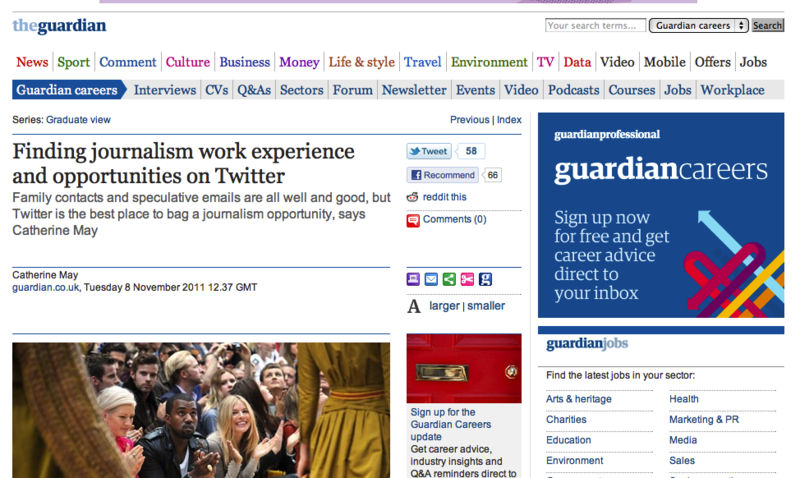 After devoting a few years of my free time to interning in the journalism sector, I got my first Guardian byline. And within that same week I volunteered at a BBC open day. The next week I decided I didn’t want to be a journalist. I tried to turn my back on journalism all together, saying I wouldn’t start any new projects and considered stopping the writing commitments I had. But then I realised I wanted back into the journalism game. I quickly realised I simply love to write. I moved to Australia for the first half of 2012 and wrote music reviews and weekly events round ups for two different sites. I was bored one night so I pitched another Guardian article and a few week’s later I had a proper Guardian contributor profile. The week after the second Guardian article was published I felt disconnected from the industry once more (seemingly an inadvertent occurrence the week after I write for them). But already I’m coming around to it once more. So what next? I’m looking to explore opportunities in other related sectors whilst continuing to write and edit. I want to learn more about new media and what options there are for employment within the digital world. And I want to gain as much experience as possible.